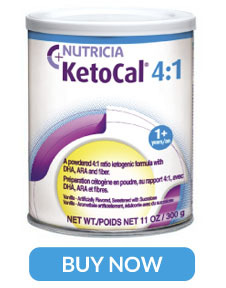 A nutritionally complete, ketogenic formula in a 4:1 ratio (fat:carbohydrate + protein) for the dietary management of intractable epilepsy; designed for individuals over 1 year of age. A medical food. Refined Vegetable Oils (Palm, Soy, High Oleic Sunflower), Casein (Milk), Soy Lecithin, Whey (Milk), Microcrystalline Cellulose, Chicory Root Inulin, Calcium Carbonate, Corn Syrup Solids, Fructooligosaccharide (FOS), Silicon Dioxide, Gum Arabic, Tripotassium Citrate, Potassium Chloride, Sodium Chloride, Calcium Phosphate Tribasic, High Amylose Corn Starch, Artificial Flavor (Vanilla), L-Arginine, L-Cystine, Choline Bitartrate, M. Alpina Oil*, C. Cohnii Oil**, Soy Fiber, L-Tryptophan, Magnesium Oxide, Sodium Caseinate (Milk), Sodium Ascorbate, L-Phenylalanine, Maltodextrin, L-Ascorbic Acid, L-Valine, L-Tyrosine, L-Carnitine, Taurine, Ferrous Sulfate, Mono- and Diglycerides, DL-alpha Tocopheryl Acetate, SucraloseÂ§,M-Inositol, L-Histidine, Zinc Sulfate, Niacinamide, Calcium D-Pantothenate, Manganese Sulfate, Cupric Sulfate, Thiamine Chloride Hydrochloride, Pyridoxine Hydrochloride, Riboflavin, Vitamin A Acetate, Ascorbyl Palmitate, Mixed Tocopherols, Folic Acid, Potassium Iodide, Sodium Molybdate, Chromium Chloride, Sodium Selenite, Phylloquinone, D-Biotin, Cholecalciferol, Cyanocobalamin.